Other Cinema logo / Craig Baldwin. All images courtesy of Baldwin and Steve Polta. It’s dark. It’s the Mission. It’s raining slightly. The sights and sounds of the street mingle with the hubbub of a busy loud bohemian night: taxis, the smell of pizza, the click of high heels, loud laughter, the waft of dope smoke. It’s all a frenzy of energy, reflections, love, and the passions of film and media and San Francisco. Other Cinema is a microcinema that has been running continuously for over 30 years. For most of that time it has been based at 992 Valencia Street, ATA Gallery, San Francisco. My first experience of Other Cinema was when I arrived as a visiting filmmaker to San Francisco in January 1992. I had met Lynne Sachs in Oberhausen, Germany at the short film festival there and she had invited me to visit the city. 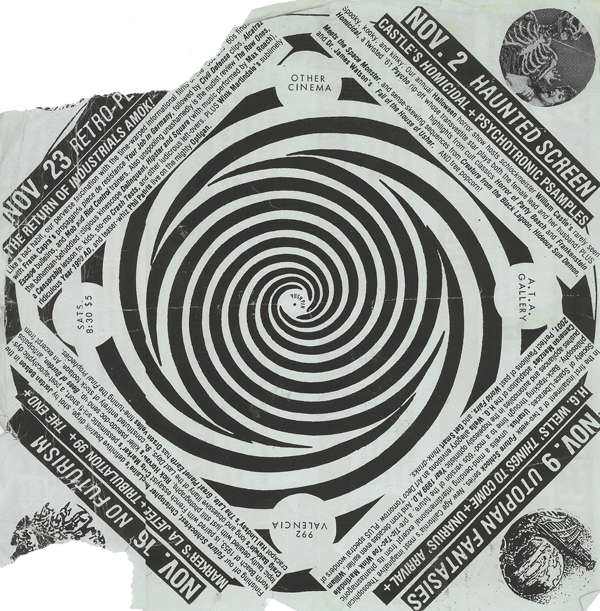 I had noticed there seemed to be a lot of work involving optical printing and “found footage” in the works from San Francisco artists at Oberhausen and Sachs explained that this was in fact part of a whole movement that was happening in the Bay Area. I wanted to find out more about it. I had lived in California as a kid in the late-60s so was familiar with the culture, and the prospect of touring the West Coast with my 1991 film Puppenhead sounded like a good way to spend a few months. So I saved some money and flew to San Francisco from Melbourne. 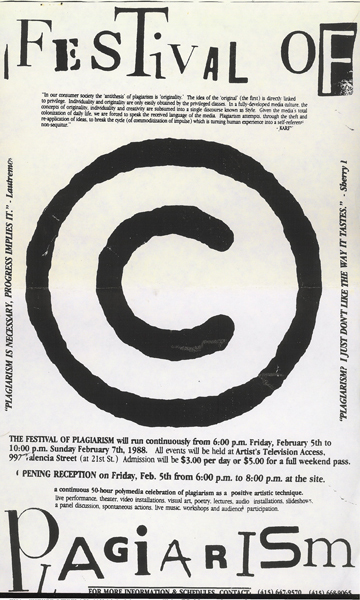 Craig Baldwin hosted my films Puppenhead, Tatlin (1990), and Monuments Far and Strange (1989) at Other Cinema. The theme of the night was Aussie film. Foster’s Lager and Vegemite sandwiches were laid out. As I became more involved with Other Cinema, I started to better understand the way it worked within the local independent film community. Filmmakers would deliver Craig their work either in person or via mail on VHS; he’d look at it, and then if he approved, would schedule it in one of two calendars – Spring or Fall. These roughly corresponded to the academic time frames. 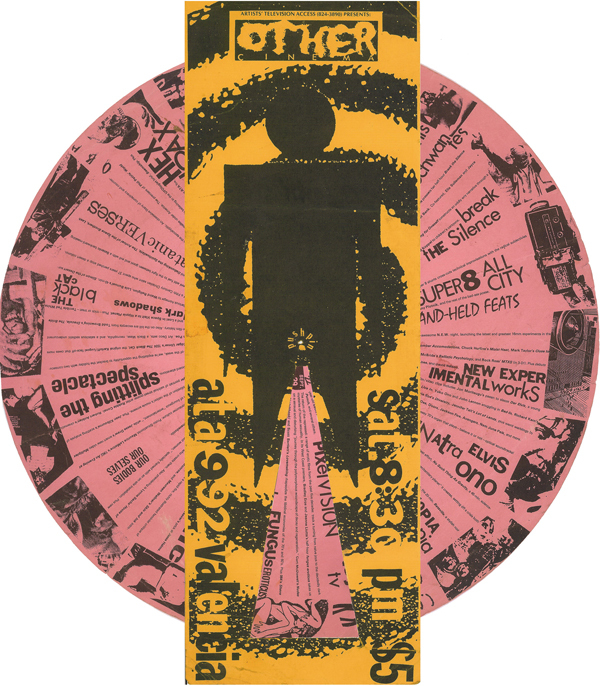 The informal underground world of 16mm, Super 8, experimental, and avant-garde film really had no other form of expression in the city, other than the San Francisco Cinematheque, which tended to be more structured, formal and academic in its focus, or the “No Nothing” screenings held in nearby SOMA. Other Cinema was really the hub of activity if you were an unknown filmmaker wanting to get something seen in SF. Of course you needed to know Craig, or someone who knew him. It was that kind of a scene. It is impossible to talk about Other Cinema without talking about Craig Baldwin. The man has galvanized the entire San Francisco underground film and video scene for well over 30 years, and Other Cinema has been the gathering place and scene for so many local filmmakers: Greta Snider, Bill Daniel, Liz Canning, Martha Colburn, Sam Green, Lynne Sachs, James Hong, Bryan Boyce, Vanessa Renwick, to name but a few. A cursory glance at any of the calendars from OC’s past will reveal literally hundreds of filmmakers and artists, many of whom are now extremely well known and many of whom owe their start to Craig and OC. In the early-1990s, the US was a different country, and the world was a different place. The Internet had not yet changed global communications. The market had not yet been deregulated. International travel was becoming cheaper and easier. 16mm and Super 8 were still formats that people used on a regular basis and video was still an analog form. Nobody carried cellphones. There was no YouTube. Instead, people mailed VHS tapes to each other, often at great expense. 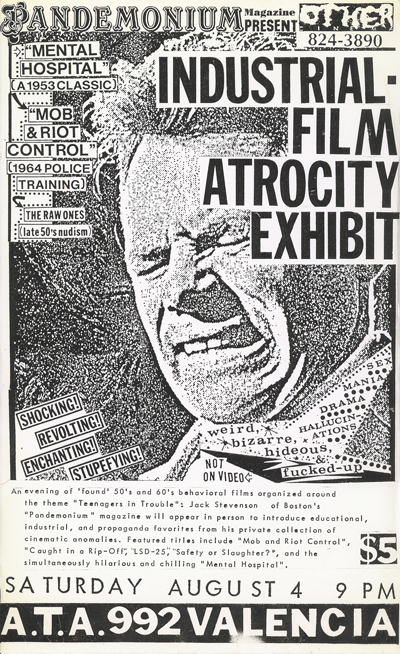 There were institutions dedicated to actively supporting filmmakers like Film Arts Foundation in San Francisco, and the Australian Film Commission, which funded experimental and non-commercial productions. To walk into such places was to find filmmakers loading cameras with real film, operating optical printers, and editing film on four and six-plate editing consoles. Video was easy to shoot but expensive to edit, and quite hard to get seen. If you wanted to make a film, you could find a way to get it done, and money to make it happen. 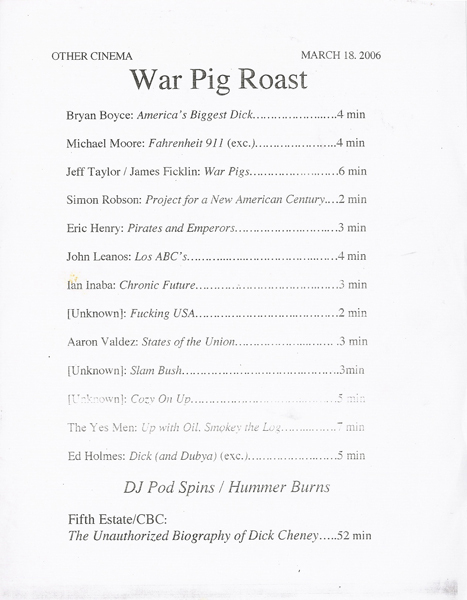 A generalized “Cold-War-is-Just-Over” sense of media emergency was very prevalent. Panic, threat and anxiety were common feelings. The cops and the population were often in tense standoff, particularly around the Mission District where many artists and activists were based and where many immigrants and people of color were made to feel very much on the outside. Other Cinema was and still is a dense and vibrant social scene. It is a hub of exchange and a site for the circulation of resources and inspiration. In Craig’s basement studio today, just as it was 20 years ago, are stacks and stacks of VHS tapes. One area houses well over 3000 16mm movie prints. This is where he makes his award-winning feature films, but it is also where the Other Cinema shows are put together. It is where the ideas and themes and concepts for the shows and the actual hard work of putting them together is done. Craig relies upon a core group of people to assist him. 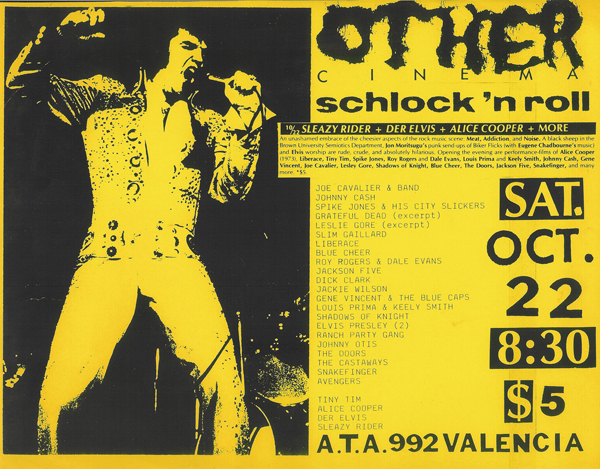 Steve Polta, also artistic director of the SF Cinematheque, mans the door, Sylvia Schedelbauer is the Other Cinema webmaster, and Christine Metropoulos, helms Other Cinema’s online publication Otherzine. Back in the early-1990s, a decade and a half of uninterrupted neo-conservatism in the form of Ronald Reagan and George Bush (the first) and the then-recent Gulf “war” had given rise to a polarized America where the wealthy minority was clearly intent on keeping their grips on power. Much of California resembled the movie They Live (1980), where creepy outer space invading aliens disguised as Yuppies sneered arrogantly from luxury cars and apartments at the underclass around them. During the 1990s, as the Internet became an aggressive and ruthlessly commercial force, the “dotcom” boom turned the Mission District into a haven for cashed-up software engineers and project managers, who were soon forcing out the local population. Many artists had moved to the Mission for the cheap rents. Now clueless software people with venture capital money were buying up live/work condos and changing the place into an oasis for idiots. Gone was our bohemian scene with each passing year. Today the Mission is rapidly becoming a luxury area as fast as the real estate developers can make it happen. Who knows how long ATA and Other Cinema can last here, but its longevity is a function of its formula. Tightly organized shows based around regular season-to-season themes: Optronica – electronic music played live with screen projection; Avant to Live – new experimental works from the ultra-vibrant local and national scene; Industrials Amok – industrial and “orphan” films from the past 50 years of American corporate and educational culture. Then there are shows based around key artists. It’s all about “who will draw.” Craig always aims to have the artist physically present at their screening. It’s a cinema. Smaller in scale maybe, but a cinema just like any other, catering to the tastes of an often disconcertingly different Mission culture to the one I remember from 20 years ago. 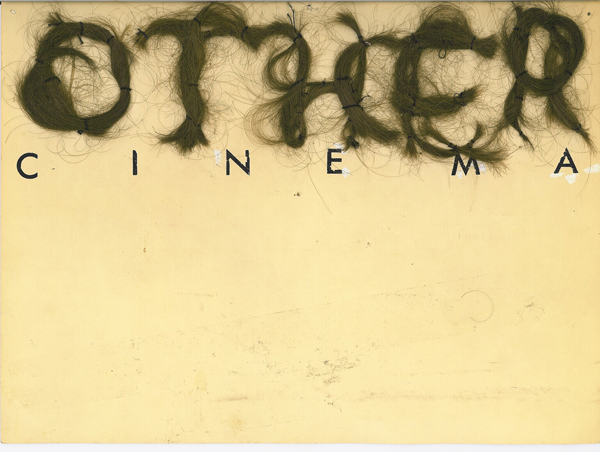 February 1992: I helped Craig with some artwork for Other Cinema. I made an anaglyph 3D version of the OC calendar for the Spring 1992 schedule. I animated some titles for his film ¡O No Coronado! 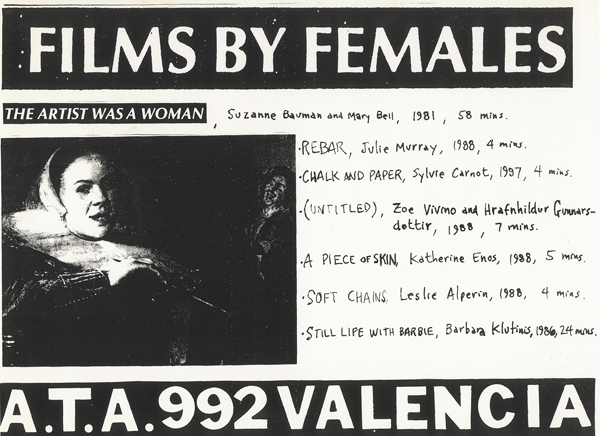 (1992). I taught some stop-motion workshops at Film Arts Foundation. I took a bus up to Olympia, Washington, where I stayed with Mark Hosler from Negativland, and recorded some music on his 4-track tape deck. While there, I also showed my films at the Olympia Film Society (Capitol Theater) and taught some animation workshops with the then new Olympia Film Ranch. I traveled up to Seattle, then Vancouver, showing my films, demonstrating animation, before returning to San Francisco. They were great times. I was 32 years old, with a suitcase full of 16mm prints and a backpack of clothes. Other Cinema became my base. I learned that it was a kind of hub for filmmakers passing through the city. Like myself, many others had done what I had done. Come into town, shown their work, stayed a few nights, done a bit of work for Craig, maybe bought some found footage from his archive. Hung out. Made the scene. I ended up spending almost six months in the USA and Canada in 1992. What Other Cinema offered, and still offers, is an inclusive scene that is focused around the work of similarly minded filmmakers who share a passion for ideas. Under the screen, a table is set up: “Free pencils.” “Free VHS tapes.” Craig is always giving things back to the community. That’s what it’s supposed to be about, after all. 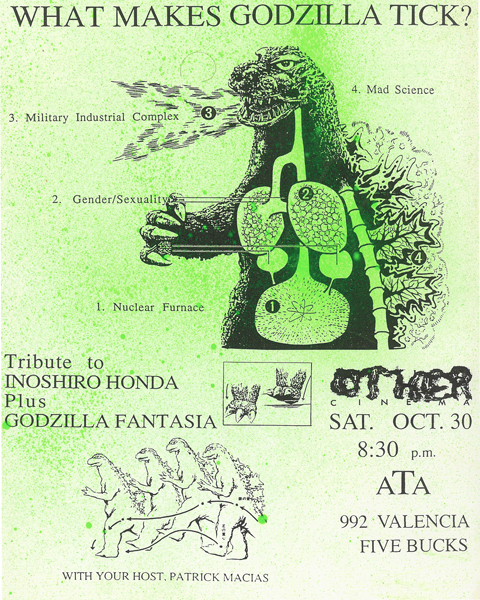 I met my wife Molly Hankwitz in 1998 in Craig’s basement studio, and we both contribute regularly to Otherzine. Molly and I both show our work at OC when we have work to show, and you can usually find me playing the Optigan on the Optronica shows. I’m an Other Cinema regular and an old-timer. I’m proud to say I’ve been a part of it, albeit in a modest way now for 20 years. Here’s to another 20.